I’m in Canada at the moment – on holiday! Travel has come to mean effort for the last five or so years. It’s pretty rare that I go away and have the chance to fully relax – these days I’m either diving or have specifically traveled to photograph this or that. My Mum and Dad both have significant birthdays this year so we’re here to celebrate and relax with them, while also fulfilling a life-long dream of theirs to visit Niagara Falls. Anyway, I’ve brought a camera or two. It would have been a crime not to given that the friends who very kindly lent us their holiday home told us of chipmunks, groundhogs, raccoons and a single sighting of a bear, and all of that without leaving the house! 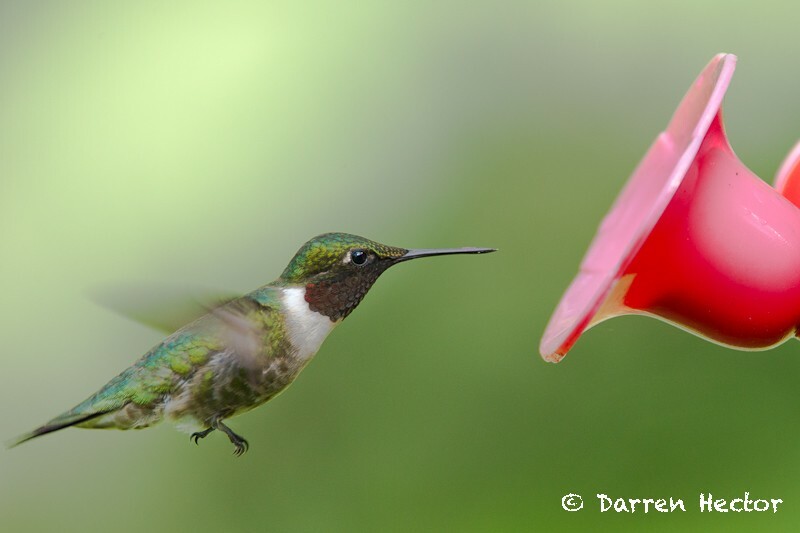 They’ve also a garden full of the most wonderful birds – we even spotted an as yet unidentified hawk’s nest today, and of course there are these amazing hummingbirds who come to feed on a special feeder containing sugar water. After a day of rest and a day sightseeing, today seemed to be the day to get some pictures of these highly active birds. The wings flap so fast that even at 1/2000th of a second the wings are blurred (this particular image is 1/500th). I’ll get a freeze frame before I go but I spent today pushing the ISO on my camera higher and higher to try and capture those wings without movement. It will need a very bright day which usually isn’t that great for photography but in this case needs must and I’ll have to make do with the compromise. What makes this image even more special though is it’s my first. For the first few tries every time I touched the shutter they flew off. I then switched off image stabilisation on the lens and they didn’t flee – must have been something to do with the ultrasonic mechanism. Even after that it takes a bit of practice to focus and capture before they fly off. I’ve had a look through the rest of today’s images, and I’m not sure I have better. Sometimes one frame is all you need! Posted on Friday, June 1st, 2012 at 1:47 am. Filed under: Birds Tags: birds, Canada, feeder, holiday, Hummingbirds, sugar water	RSS 2.0 feed. Gorgeous! Your camera takes great pictures! Hah, sorry, couldn’t resist. Very nice hummer! Well captured & Kudos from here in Texas! Thanks John. They’re great little things to watch. Thanks Terry. I do quite like the ‘do everything’ mode. What really impressed me was when the camera got up, went outside and quietly set up in exactly the right position, then waited for one of the birds to come along. I slept all the way through! would wacking a few speed lights on hi speed sync freeze the frame? Good thought Olly, but I’d need sync speed of about 1/2500th which is a world outside of typical range.